Ok, a rather dramatic title but it was just too tempting… in fact this is just a little plug here for the September 2012 issue of the prestigious Project Management Institute’s (PMI) ‘PM Network’ magazine – because I’m in it and quite proud of the fact. For those of you that don’t know, the PMI is the world’s leading professional association for Project Management and therefore quite a big deal in the PM world. A few months ago David Whitemyer, contacted me and asked if I’d like to contribute to an article he was writing called “Negating Negativity” – of course I accepted. The piece focussed on why negativity commonly arises and how project managers should deal with negativity from team members, stakeholders, clients and sponsors that behave badly, all of which can spell disaster for a project’s outcome. With the project manager’s head on the block each time, being able to foresee, manage and resolve any issues relating to negativity is absolutely crucial in forging a successful career in project management. Or, another way to put this is… why do people whinge and when you have to manage negative assholes on a project how do you do it? The below excerpt is one piece of advice I give. I shan’t go into too much detail about the article as you have to be a paying PMI member to receive this publication, but what I did find interesting was the contrast between the topic of managing others being negative and one of my previous articles, Negativity in Web Project Management Isn’t Always Bad, where I discuss when a Web Project Manager must risk being seen as negative. 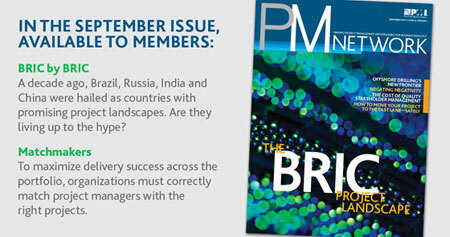 So if you’re a PMI member already, I hope you enjoy reading the article, if not, why not become a member and read it – or if you’re not a Web Project Manager and are reading this, I have enjoyed reinforcing your image of project managers as grey, dull, unskilled and corporate.